Delikon interlocked stainless steel liquid tight conduit systems are part of an equipment or an electrical installation that is made to last. 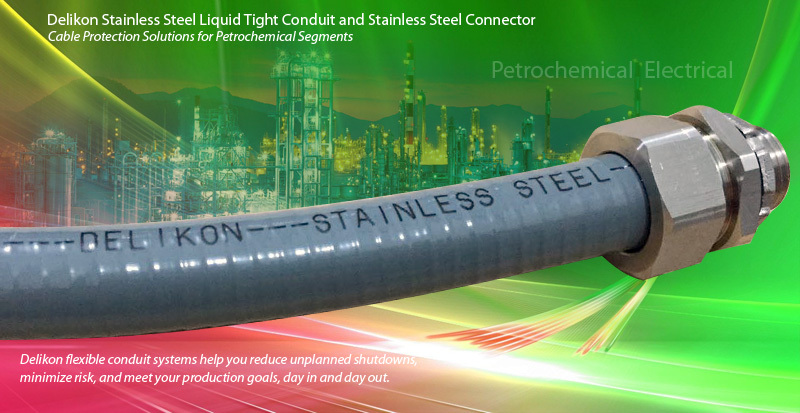 The strength of stainless steel, combined with its resistance to wear and corrosion, makes Delikon stainless steel liquid tight conduit and stainless steel connector a prime candidate for MINING AND QUARRYING, POWER GENERATION, CHEMICAL AND PETROCHEMICAL,FOOD AND BEVERAGE INDUSTRY, WATER TREATMENT INDUSTRY, PHARMACEUTICALS INDUSTRY, TRANSPORT INDUSTRY and more. Delikon stainless steel liquidtight conduit system has low maintenance cost and is frequently chosen for superior corrosion-resistance performance.